Exposure to hazardous substances in and around sites dismantling electronic and electrical waste (e-waste) poses numerous health and safety risks for waste collectors, recyclers and neighbouring communities. Marginalized populations disproportionately suffer the negative effects of improper e-waste practices. Unsound e-waste management practices in the informal sector of the economy involve hundreds or thousands of poor people, many of whom are unaware of the hazards of exposure to toxics in e-waste. The most vulnerable groups, especially children and old women, are actively involved in e-waste scavenging and crude recycling activities especially in African countries such as Ghana and Nigeria. The engagement of men, women, boys and girls in informal e-waste management differs from country to country, however some common trends can be observed. A study on the informal e-waste management sector revealed that the e-waste refurbishing, collection and recycling sectors in Nigeria are dominated by adult and child male workers. There are hardly any women working in refurbishing and repair operations itself. Nevertheless, women make up a significant share of the workforce among the waste picker communities on dumpsites, where women and girls are estimated to make up around 30% of the workforce. Nigeria and Ghana do not have any formal e-waste recycling facilities, so e-waste is dumped in existing municipal waste dumpsites in urban centres, especially in Computer Village, Ikeja and Alaba international market in Lagos; and in Agbogbloshie in Accra. At these dumpsites, women and children (often young boys) are e-waste pickers who scavenge for any valuable components, earning between USD 1 and USD 3 a day by collecting components. The children burn cables and wires to recover reusable metals like copper wire. In the process, toxic chemicals including dioxins and metals are released into the surrounding environment. Girls hawking water in polythene sachets sell water to the boys to put out burning cables as burnt copper wires fetch less money compared to un-burnt copper. While the scrap metal sector often uses child labourers, child labour is uncommon in the refurbishing sector. Collection and dismantling activities are carried out by children from the age of 12, however younger children from the age of 5 are sometimes engaged in light work, including dismantling of small parts, such as the recovery of copper containing deflection coils in the cathode-ray tube monitors, and sorting of materials. Children were also seen to be involved in e-waste collection and burning activities. In Ghana, field observations and Greenpeace reports confirmed the employment of children, mostly boys, sometimes as young as 5 years old and mostly between 11 and 18 years in the informal e-waste recycling sector. Young girls aged between 9 and 12 years old were also observed working as collectors, and in many cases as vendors of water sachets, at Agbogbloshie, Ghana. 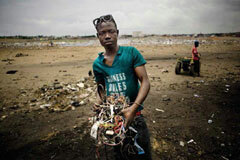 Working conditions in the informal e-waste management sector are very difficult. Most of those employed in the e-waste recycling sector in Ghana, aged mostly between 14 to 40 years, were found to work for 10 to 12 hours per day, i.e. 300 to 360 hours per month. In the refurbishing sector, people worked between 8 to 10 hours per day or 210 to 260 hours per month. Furthermore, evidence suggests that incomes of children between 5 and 14 years old could be as low as USD20 per month in the collection sector, which is significantly lower the average income of USD 70 to USD 140 per month. In areas where the informal e-waste recycling and refurbishing activities are centered, such as Agbogbloshie in Accra, Ghana and Ikeja Computer Village and Alaba International Market, Lagos, Nigeria, concentrations of copper, lead, zinc and tin can be in the magnitude of over one hundred times typical background levels. It is known that children, due to their hand-to-mouth behaviour, are one of the most vulnerable groups in areas where soil and dust are contaminated with lead. Exposure to lead dust or fumes leads to the underdevelopment of brain of children, hence causing intellectual impairment. A report by the Shantou Medical University Hospital in November 2003 found a high incidence of skin damage, headaches, vertigo, nausea, chronic gastritis, and gastric and duodenal ulcers, especially among children and women in Guiyi, China, who recycle circuit boards and plastic. Another study has revealed e-waste labourers in China have very high concentrations of toxic flame retardants in their bodies. This situation could already exist in the African region among e-waste scavengers.